Even though I had a wonderful stay at Vokterboligen, I had a feeling of unease I could not seem to shake off, or even understand. There I was, warm and dry, enjoying bread and coffee in front of the fireplace before going to a soft bed. something felt wrong. I thought maybe I was afraid of getting lost again. Sven-Erik had mentioned that the route might not be too well marked between the cabins further south, and I found out to my horror that I was one map short. Sven-Erik then suggested to meet up by Gautelisvatnet two days later and walk together up to the next cabin. There, he would bring a map that covered the other cabins. Truly a man with the heart on the right place. Reasured, I walked on after a nice, warm lunch. It was raining a bit, so I had a short break at Katterat station. Here, I met a girl who also walked through Norway, only she was heading north. We shared stories and experiences, and told each other what to expect for the coming weeks. An hour later, it stopped raining and the sun appeared. But my body and brain felt heavy, so when I lost the trail, I lost my head completely. It was the first time I truly considered quitting. I was so tired of everything, and the uneasy feeling from earlier was overwhelming. As I climbed up the mountain, slipping and sliding on wet stones, I cried for my boyfriend, only wanting to be in his safe arms. On top of the Devil’s Passage (that being the passage’s actual name), I got enough signal to send Simon a message, begging him to come and visit me in September. This is something we had talked about earlier, I guess I just needed the confirmation. He could reassure me that he would come. Even though I was in distress, I was aware of my surroundings. It was absolutely beautiful, with waterfalls and lakes in the color of deep turquoise. When I arrived the emergency hut I had planned to take shelter in, the sun was setting, painting the sky pail pink. The hut was occupied by a Swedish father and his daughter, Waldemar and Helena, so I had to put up my tent outside. I ate my dinner in the hut in their company, and we talked and shared stories before going to bed. After talking to my boyfriend and after meeting Waldemar and Helena, I realised why I was feeling so down. It was such a powerful and overwhelming feeling of loneliness I could hardly breath. Everyone I met, was walking in two’s or three’s. I felt more alone than ever before. Of course, I’ve missed my Simon and my family and friends during my trip, but this was something more. Tears kept falling while I was walking, all the way to Cunojàvri. Here, I met a group of friendly Norwegians, eating lunch outside the cabins. I joined them for a little while, and while they were questioning me about my journey, they fed me dried reindeer meat, chips and candy. THANK YOU GUYS! I’m being tested everyday, some days to my limit. But I’ve learned that if I get annoyed, angry or impatient, a 5 minutes break make wonders. Then I don’t make rash and stupid decisions, and I can carry on walking with some renewed energy. My day ended after 22km, and I took shelter in the Caihnavagge cabin. When I arrived, the sun shun through the clouds, and I became aware of the location of the cabin. Surrounded by green vegetation and snow covered mountains, and with a river running by ending up in a turquoise lake. Today was the day I was going to meet Tove and Sven Erik, and since ‘before noon’ is a term open for interpretation, I started walking very early, just to be safe. The terrain was quite difficult though, so it went real slow. Just to get down from the mountain, took me an hour and a half (but the view was breathtaking!). I met my company a little later than planned, so I’ve learned that when you don’t have the modern luxury like phones available, a more precise timeframe is important to establish. But again, Tove and Sven Erik helped me in so many ways. If they only knew how grateful I am. I was so mentally tired, so to reach the next cabin, and to have it all by myself, was just what I needed. My motivation was slowly coming back, and it felt good. Managing a steep climb in a good tempo made me happy, so I awarded myself with a pat on the shoulder and a piece of chocolate. The further I walked, the more beautiful the surroundings became. Reaching hills and mountain tops, I discovered new and exciting landscapes. Halfway, I met a lady who was not very optimistic about my coming path. 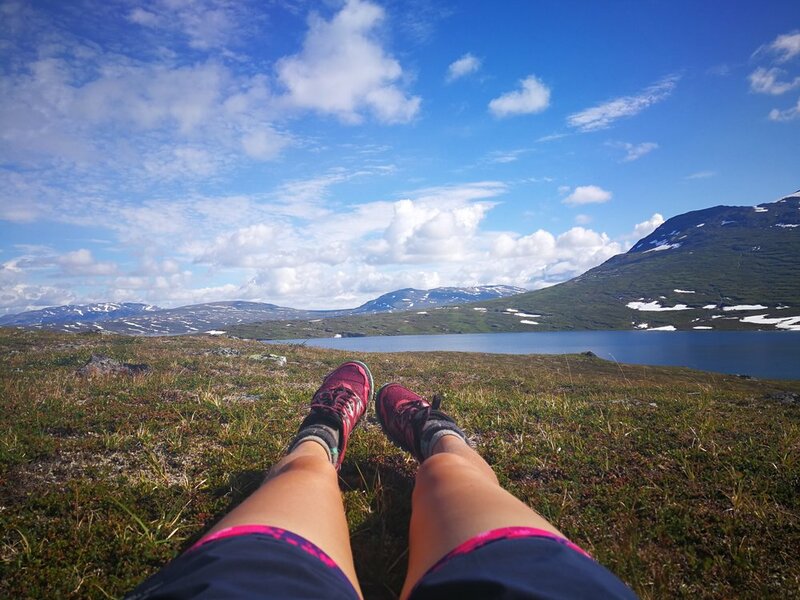 In fact, her plan was also to walk down to Sulitjelma, but had decided to turn around and go back because of all the snow and the trail gossip. She had been warned about shady bridges and dangerous river crossings and her negativity was very contagious. Luckily, I had already encountered trail gossip, and I knew better than to be defeated by it. Maybe in defiance, I felt heartened when I continued, because I had decided that I was going to make it. Not by being stupid and carry on no matter what, but not to be controlled by fear. And I’m so happy I continued. I had the most beautiful day up in the 30 degree- snow-covered-mosquito-free mountains. My focus was no longer to reach my destination, but to enjoy the moment. Seeing the cabin from far away, I decided to take my time. I get easily impatient when I see my destination, and I didn’t want the last kilometres to be a struggle. The location of the Pauro cabin, is the most beautiful place I’ve ever been. I warmly recommend it! To all hikers: when you encounter trail gossip, don’t be discouraged. Listen to what other hikers tell you, but bear in mind that they might talk out of their fears, restrictions and limits. Their experience might be completely different from yours. 1 kilometer away from Pauro, there was a river crossing I had to do by boat. Normally, there would have been two boats, one on each side of the bank, but not today. I had been forewarned that one of the boats were missing. Luckily for me, the boat was on my side of the lake. It was only 30 meters to the other side, but if it weren’t for the boat, I would’ve had to walk 10 km around the lake, so I was truly grateful. The next obstacle, was the shady bridge people had told me about. Alright, it was maybe not the most secure bridge in the world, but crossing it – no problemo! It’s amazing how fast things can change. Weather, conditions, and least of all, how I feel. After crossing the bridge, I felt invincible. Even when I lost the trail, I was able to let go of the mania of following it. I just oriented myself after the surroundings and had no problem finding the right way. 6 km away from the cabin, however, I got both stressed and impatient. I saw some dark clouds up ahead and I wanted to reach the cabin before the rain hit me. I lost the trail and ended up following the wrong river. For hours I stumbled around trying to find the cabin. Too stubborn to stop and figure out exactly where I was, I ended up far, far away from where I should have been. Eventually, I found the trail and I followed it for a few hours. My body had nothing more to give, and I still was not able to figure out where I was. Deciding then that what I needed was some food and some sleep, I pitched up the tent, thinking I might think more clearly the following morning. I prayed a lot that night. I prayed for strength and courage, and help to find my way. In the middle of the night, I suddenly work up and I knew exactly where I had done wrong. A few more hours sleep, I thought, and I will go back the way I came from. Fear. The overwhelming feeling of fear. I was shaking and I was dizzy and nauseous. I had a lump in my stomach that was aching so bad I couldn’t stand up straight. But the fact that I had decided to head back the way I came from, gave me enough strength to continue. The feeling when you find out where you are when you thought you were completely lost, is indescribable. 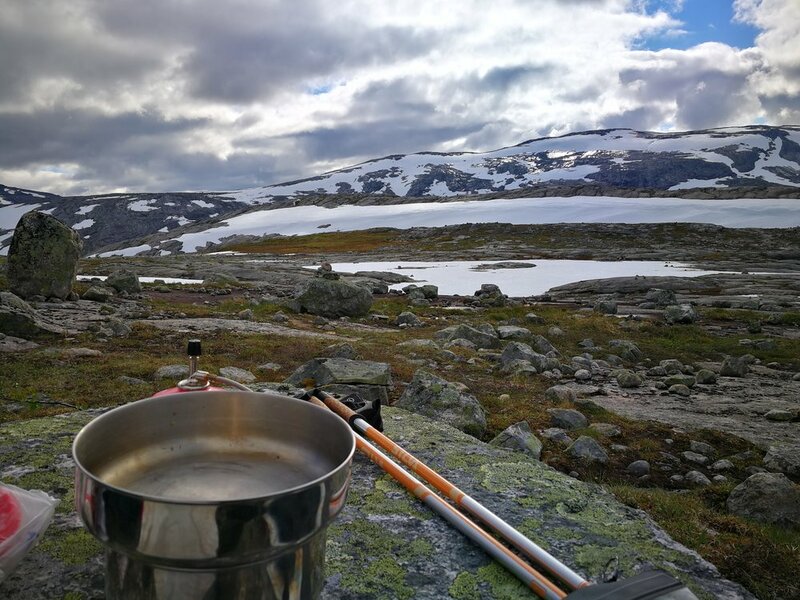 If it weren’t for the fact that I had spent all my tears, I would have been crying with relief when I got back on the right trail (apparently, I had followed another one, ‘Gränsleden’). Instead, I sat down and ate my Snickers. I felt so heartened being on the trail again it gave me energy. But my body was heavy and the terrain was tough, so it went slow. Somebody once told me that to meet people on the trail, is just like having a piece of chocolate. So true! When I met Gerald, I was so happy. We stopped and had a long conversation before departing, and after, my feet weren’t as heavy anymore.